The Bolivar Royal Coronas is an all-star, a full and rich Robusto, 4.9” (124mm) long, of 50 ring gauge, and comes in aluminum tubes in a 10 cigars box. Rated the Number 1 Cigar of the Year by Cigar Aficionado in 2006. Along with the Bolivar Belicosos Finos and the Bolivar Petit Corona, it is another best seller. 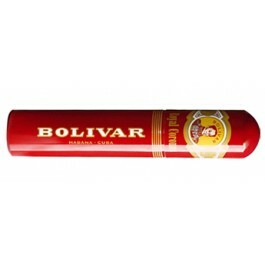 We believe the Bolivar Royal Coronas is a cigar that gets overlooked by popular brands such as Cohiba and Partagas. It has lovely aromas of hay, barnyard, coffee and spices. A 1973 release. The Bolivar Royal Coronas is one of the best examples of a Robusto and for many connoisseurs; this vitola may be classified in the "Top 5 Robustos". • In general, when it comes to Robusto shapes, the blockbusters such as Cohiba Robusto or Partagas Serie D No.4 attract Havana's smokers. Do not be hasty, take the time to experience the Royal Corona and you will be thrilled. • The flavor of the blend makes it an attractive choice for those who wish to experience a full bodied and complex Habanos in a shorter amount of time. This is a smooth and complex robusto with balanced earthy and peppery flavors. The wrapper on the cigar has that golden brown hue. There is a silky texture to the cigar, shiny to look at, and there are few veins present. It has lovely aromas of hay, barnyard, coffee and spices. We really consider the flavor profile of a Bolivar to be likened to days of old, and it is right up our alley. The draw is slightly loose, as expected, resulting in an overwhelming cloud of thick smoke after each draw. The cigar burns evenly all the way through. Every inconsistence in the burn is quickly self correcting, with no need of a touch up or re-lights. The ash is firm, light grey in color, and stays on the cigar reaching more than an inch in length. As you light up the robusto, we are met with the warm and comforting flavors of hay, Asian spices, coffee and wood. As we get further into the first third we begin to get some soft cocoa notes, and that barnyard flavor profile is dominant and very enjoyable. In the second third, there are some additional flavors. There is a nice bit of leather, wood, spices and the barnyard flavor is still present. It has a lovely finish of nuts, toast, coffee and cocoa. It is definitely a complex cigar with those rich characteristics, and very flavorful. . Reaching the final third of the cigar we get a mouthful of rich flavors. There is definitely a mocha flavor profile with the cigar. Those coffee and cocoa flavors really come together, and they pair wonderfully with a nutty and toasty flavor profile along with barnyard twang and the cigar has a nice strong finish of leather and spices. To summarize, one very good thing about this smoke is that it does not need long ageing, Even when young, the Bolivar Royal Corona is a remarkable cigar. We do not have to wait to enjoy it. However, aging makes it even better.